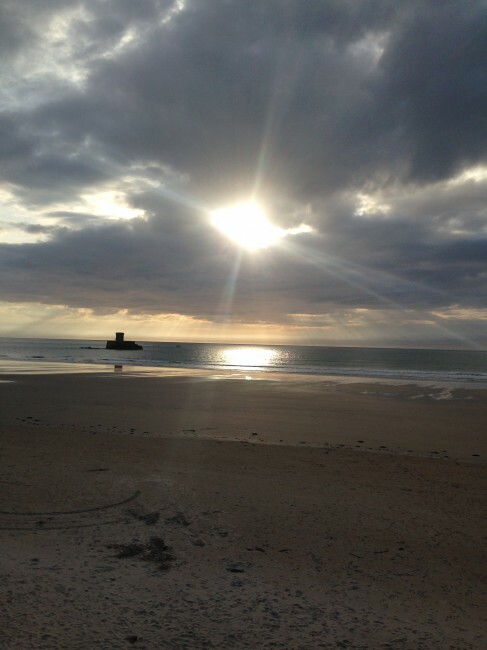 I always love an excuse for a trip to Jersey! Such a cool place for water sports, and a great bunch of guys and girls. We were really pleased when we managed to secure an event on the rock for the series. A good contingent of UK paddlers prepared to make the trip over, loading up cars and vans to the max. with boards and bodies. 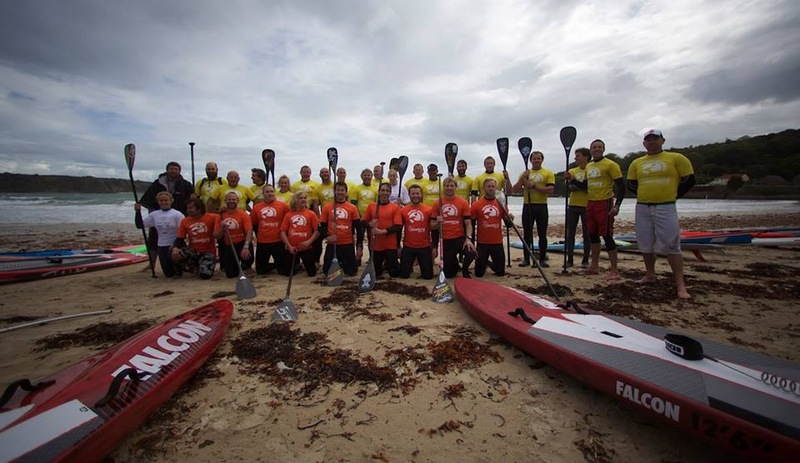 We arrived Friday and managed to get some fun surfing done, a big get together of all paddlers was arranged for the evening and it was great to catch up with everyone. Saturday race day was not looking good from a weather forecast perspective. I met with the event organisers early to discuss options and course maps. 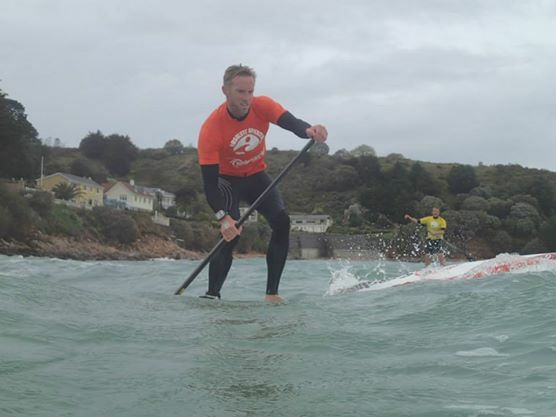 We moved the event round into a more sheltered bay and came up with a couple of flexible course options that would utilise the breaking waves that often bend into the bay on big swells. Everyone got ready to race, a few storm fronts came through with driving rain making everyone run for cover, but just as race time came the skies cleared a little and we were set to go. 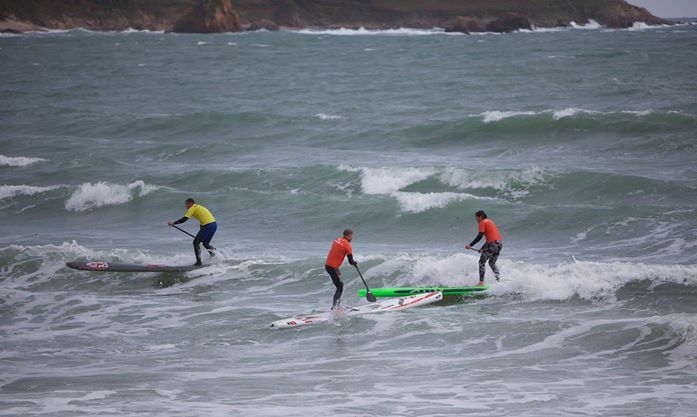 The firsts leg out to the far headland was pretty much into the wind, about half way we passed a pier and that’s where it all started to go wrong 🙂 there was huge backwash making the water a crazy maelstrom bouncing paddlers around and off their boards everywhere. I managed to stay on this lap and close with Aaron and Ollie. We turned the out side buoy and headed back what we hope was going to be downwind, but it was kind of cross wind and swell and made it really tricky. I fell and Ollie and Aaron pulled a huge gap instantly. The inside turn was right in the shorebreak, I managed to catch a sweet ride all the way in, jumped off in the shallows & made the turn. Getting back out through the shorebreak was challenging. I got a few shoeings until I made it back out & eventually onto Lap 2. On the upwind section local guy Andre L’Geyt overtook me after a few falls in the backwash. I got back to him by the turn but again on the downwind leg I fell & lost time. At the end of the lap they told us the race was going to be shortened from 4 to 3 laps, great news as it was really really tough. I dug deep & headed out for the final lap. As I headed out to the pier a crazy weather squall came through. 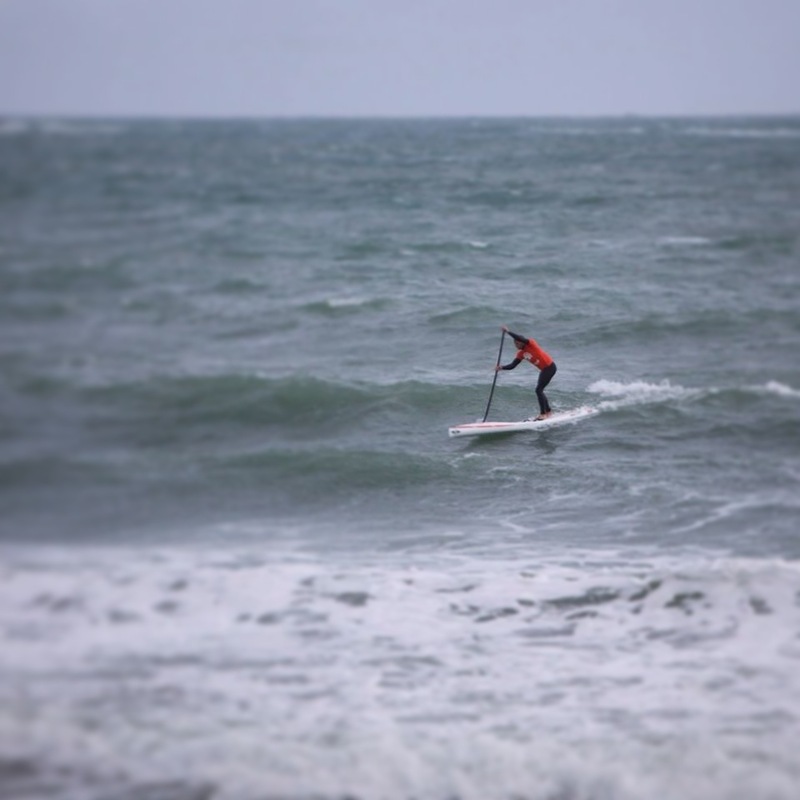 I was with Andy Joyce battling out, he got clean blown off & was =struggling to maintain control of his board in the wind to even get back on. Looking at my GPS after we were doing 3kph flat out! The wind must have been gusting 40MPH+. This was a pure test of mental will to continue. I had already noticed a few paddlers drop out of the race. Head down I just kept turning over the paddle, trying not to look too far ahead, before I knew it I was at the outside turn again ready for the final downwind. The squall that ended it all! Andy & John were close behind on this last leg, I fell & they came past, they fell & I passed them. It was actually quite funny! As we neared the shorebreak turn I caught a wave at the same time as Andy, we rode in & both got annihilated by it! Boards & bodies everywhere! I was quick to jump back on & literally prone surfed into the next wave, hopped to my feet & surfed to the buoy a few seconds ahead of Andy. 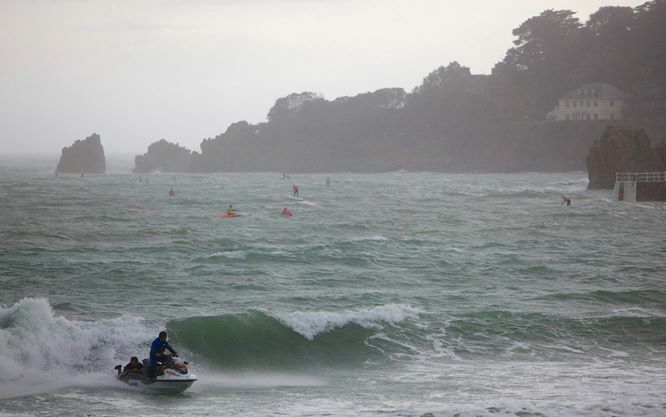 As I got there race official Stevie Ashcroft signalled the race as cancelled & asked us to come to the beach… the ridiculous storm that had just come through caused them to make the hard but wise choice to cancel the race for paddlers safety. I agreed it was the best choice, man hugs & high fives with the lads ensued as we excitedly but exhaustedly discussed the unreal race we had just taken part in. Can you believe it the following morning was clean, sunny & some sweet little waves, but hey ho that’s how it goes. 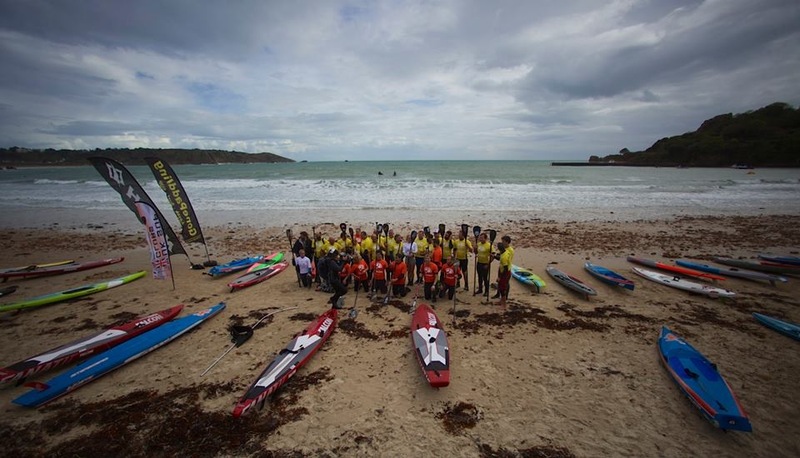 the jersey Paddle Club did a fantasic job of hosting us. The evening do was cracking, lots of beers sunk & stories told. The race I have to say was nothing short of epic. Not my best result by any means but a huge mental & physical achievement for all of the paddlers that stood on the start line that day, irrespective of board class, gender, finishing position, or if they even finished at all. It’s races like that that make those endorphins flow, it’s why we’re all addicted to the water, the power, the craziness, the unpredictability. Bring on Battle of the Rock back on Jersey later this year!